Are you worried about a bear market in 2019? Are you loaded for one? Stocks that pay dividends have a “cushion” to protect them from the bear’s claws; a cushion that others don’t. In a bear market, a dividend gives stocks support to land on when the market falls. But to really beat the bear, you don’t want just dividend-payers. You want dividend-growers. First of all, let’s establish that, yes, dividend-payers beat the market over time, rain or shine. In his book “Active Value Investing,” Vitaliy Katsenelson illustrates that between 1900 and 2000, the average annual return from the S&P 500 was 10.4%. And of that, 5.5% came from dividends. Further research showed these returns were “lumpy” depending whether it was a bull or bear market. Katsenelson found that in secular bull markets, dividends accounted for 19% of annual average stock market returns. (The rest came from capital growth.) That’s not bad. But in sideways markets, dividends accounted for 90% of the returns. Meanwhile, in his book, “The Future for Investors,” Dr. Jeremy Siegel said there are two ways dividends help your portfolio in bear markets. First, reinvesting dividends to buy more shares helps cushion the fall in a bear market. Second, those extra shares enhance future returns. Siegel says this turns dividends into a “return accelerator” once the market bottoms and prices head higher again. As you can see, all dividend-paying stocks are at the top end of S&P 500 performance. The only category that outperforms even more is dividend-growers. Second, the Davis firm did a 30-year study through 2017 specifically on dividend-growers vs. non-growers. And this study showed that not only did the growers outperform, they were also less volatile. In a bear market, non-volatility can be very attractive! Third, Ned Davis also compared the returns of U.S. stocks in 15 bull and 14 bear markets. The study found that since 1972, S&P dividend-payers outperformed non-payers by 3.4% in each bull market. Not bad. 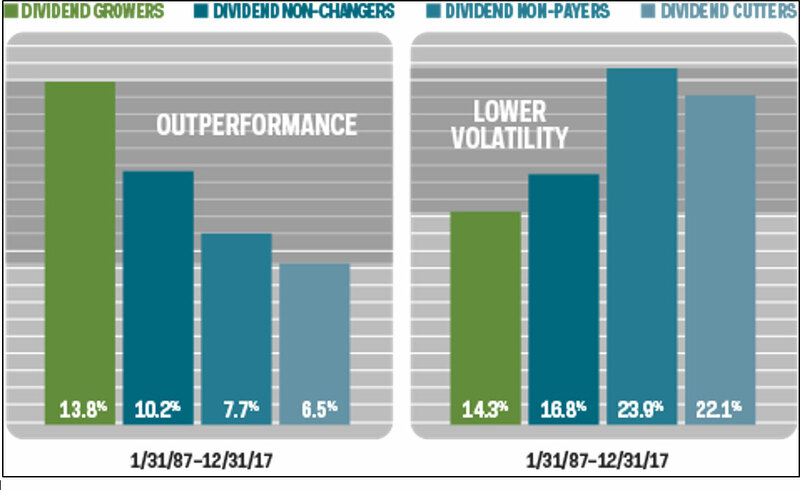 But in bear markets, dividend-payers outperformed non-payers by 12.5%. B) You especially want dividend-growers. In my Wealth Supercycle monthly newsletter, we’ve been shifting to dividend-payers as the outlook for U.S. markets has worsened. Importantly, I’m a cycles guy. So, I’m looking for dividend-payers that are riding big trends and cycles in the global economy. That means these stocks have cushion on the downside from dividends … and they are poised to rip to the upside as the big cycles come into play. If you’re doing this on your own, be careful. There’s nothing worse than buying a dividend-payer only to see that company CUT its dividend. As the chart above showed, those are the worst-performing stocks. But if you’re worried about where this market is headed, you’ll want to add more dividend-growers to your portfolio. The Vanguard Dividend Appreciation ETF (NYSE: VIG), which sports a 1.84% dividend yield and has an expense ratio of 0.08%. The ProShares S&P 500 Dividend Aristocrats (NYSE: NOBL). This ETF sports a 2.08% dividend yield and has an expense ratio of 0.35%. ETFs are generally less volatile than stocks. But you’ll have to accept lower returns in both price and dividend yield, too. Sean – Would it be possible for you to use the same type setting as you did here on your WealthSupercycle and Supercycle Investor letters ? With tired, aging eyes (mine), the larger type is much easier to read.